Bride Wars (2009) is a romantic comedy starring Kate Hudson and Anne Hathaway. Synopsis: Liv Lerner (Kate Hudson) and Emma Allan (Anne Hathaway) are best friends since childhood. They plan to get married in June at the Plaza after witnessing their first wedding during their childhood. Twenty years later, both of them are engaged and they plan their weddings with New York's most reputable wedding planner, Marion St. Claire (Candice Bergen). Due to some clerical error, their weddings are set on the same day! Both women refuse to compromise and thus begins a rivalry whereby they plot to sabotage the other party's wedding planning. If you like to read romantic comedy novels or they call them chick lit, then you will like this wedding flick - pretty girls, wedding planning, future brides, fiances, engagement, the bridezilla syndrome, wedding dresses, sappy lines, a tear or two, and the list goes on. Well, you'll either love it or hate it. 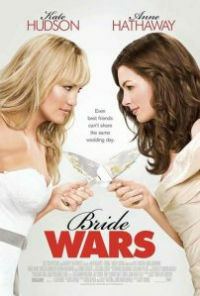 A movie critic says, "At least, and this is something to be grateful for, Bride Wars deviates from the usual wedding-flick routine of maids of honor who should be the bride (or groom). And even though the cat-fighting goes over the top, the notion that a passionate female friendship can turn ugly in a heartbeat is, sadly, realistic." Liz and Emma's wedding gowns.